I would love to view some more squirrel videos. Please post more! Squirrel videos are the best! 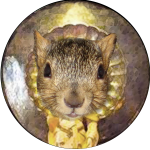 Squirrel anything just the songs of the spheres. Will do. More squirrel coming up. Thank you Adrian Galvan. What a wonderful name. There will be plenty more squirrel videos. After all I am an immortal narcissist. But a month to you is a nano second to ME (Yes, I’m hip and trendy) so you may need some patience. Have you seen all the posted videos? Something to do while you wait for the new ones. To be honest, the earlier ones are better. It’s all just gone increasingly down hill and it’s all the fault of Georgette, that sad excuse for a human channel. But I digress. Eat some spaghetti. Be happy.